At Yuletide, it is our custom to exchange gifts between members of the family, friends and other folk we are close to. This custom is important, as it strengthens the clannish bonds of unity and trust between our folk. It is also customary to wrap these gifts, but with what we wrap them has become increasingly important to the well being of not only Mother Jorth but ourselves, as our welfare is inextricably linked to Hers. The problem we have today is that much of the wrapping paper for sale is made from plastics, foil and waxes – substances that cannot be recycled when they are all mixed together. So what could be used as a recyclable substitute? Well…how about newspapers? These are perfectly recycle safe, and what’s more, they are incredibly cheap compared to wrapping paper, making them by far the most cost-effective and environmentally friendly option. Although presents wrapped with newspapers may not look pretty, it is important to remember that, just like with people, the outside appearance is not always what it seems, indeed it can be quite deceiving, but it is what is contained within that matters. During a school assembly at Yuletide when I was a child, I remember the head teacher giving us a talk on this very subject. He presented us with two gifts. One was packaged with a very flash, sparkling wrapping paper, whilst the other was wrapped in a simple brown paper bag. He asked those who would prefer to have the elaborately wrapped item as a gift to raise their hands. He then asked the same of those who would prefer to receive the simply wrapped item. Being enticed by the bright colours and silvery sparkles of the wrapping of the first item, nearly all of the children had raised their hands for this. However, then the Headmaster revealed the gift concealed by this wrapper – a stinking pair of old socks full of holes! He then opened the simple brown paper bag, and drew from it a magnificent silver watch, passed down from his grandfather as a precious heirloom. From this simple package came something of priceless value, just as within us, within our simple frame of skin and bone, lives our mighty and immortal spirit, that none can put a price on. And yet, from the extravagant wrapping, which tried to trick us into believing it can give us something great and beautiful, comes nothing more than a tired, false and empty offering. So, what have we learned from this? Well, I think the old saying, ‘Never judge a book by its cover’ fits this story perfectly, whether we are talking about other folk, gifts at Yuletide, or indeed books themselves! If you have any useful suggestions or ideas about re-using or recycling wrapping paper or any other items around your home, please email us and let us know. 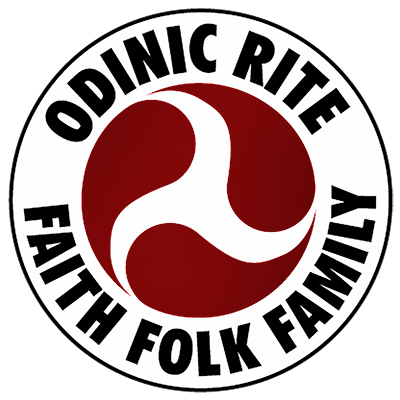 As Odinists we all have a duty to do everything we can to protect our beautiful Earth, and re-using and recycling are two of the best things we can do to help! The Importance of Preserving Heritage, Tradition and Race.